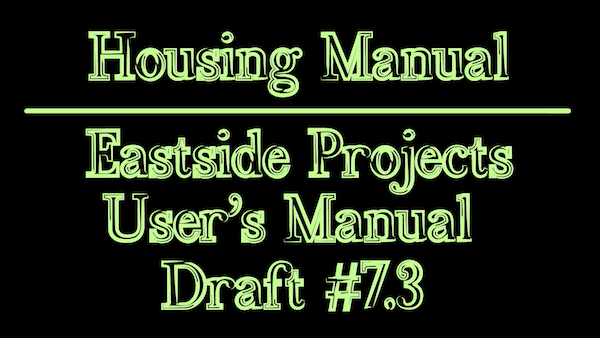 Housing Manual: Eastside Projects User’s Manual Draft #7.3 from Eastside Projects on Vimeo. Organisations do not often provide user’s manuals. 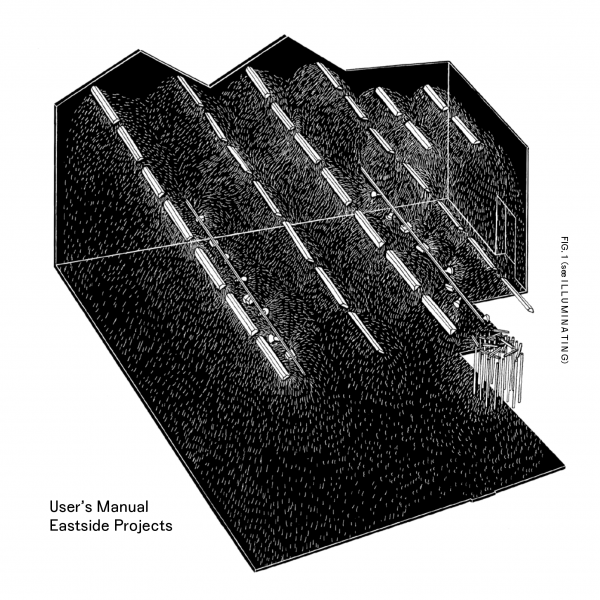 This is the seventh draft user’s manual of Eastside Projects – an artist-run multiverse based in a free public gallery in Birmingham, UK. 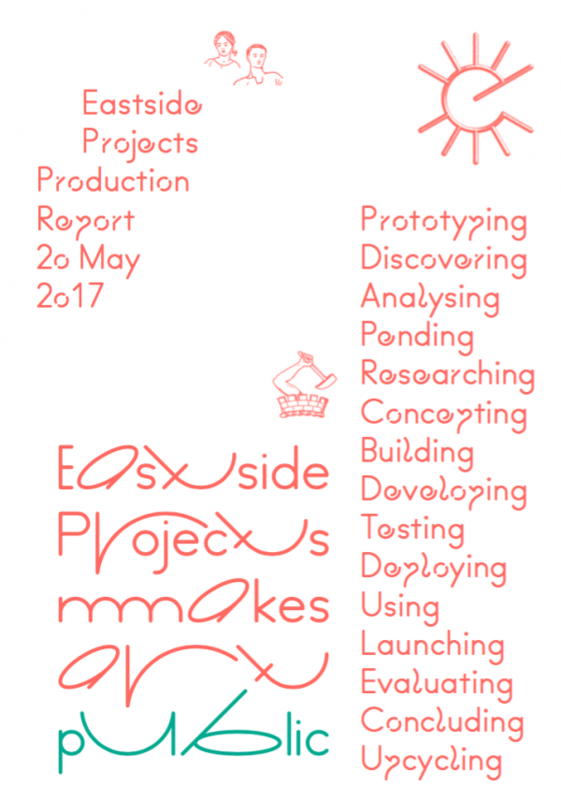 Across one week at Kunsthal Aarhus (May 27 – June 3 2017) we concepted, prototyped, developed, tested and upcycled a new set of user’s manuals for multiverse, gallery, display, production, housing and policy. Our Housing Manual was completed for Artists Housing Prototype Show, January 2019 and supported by Artcore, Derby. 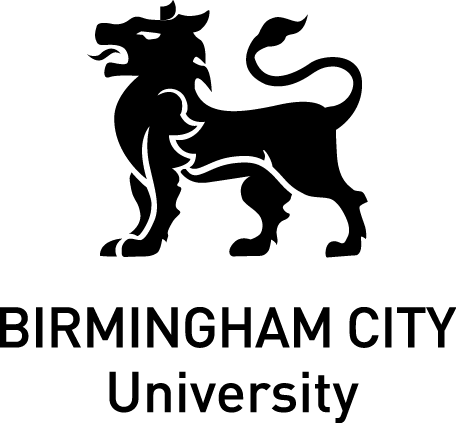 Draft #7 will explore what our multiverse is made of, who it is for, how it can be used and what we do as a set of political actions. 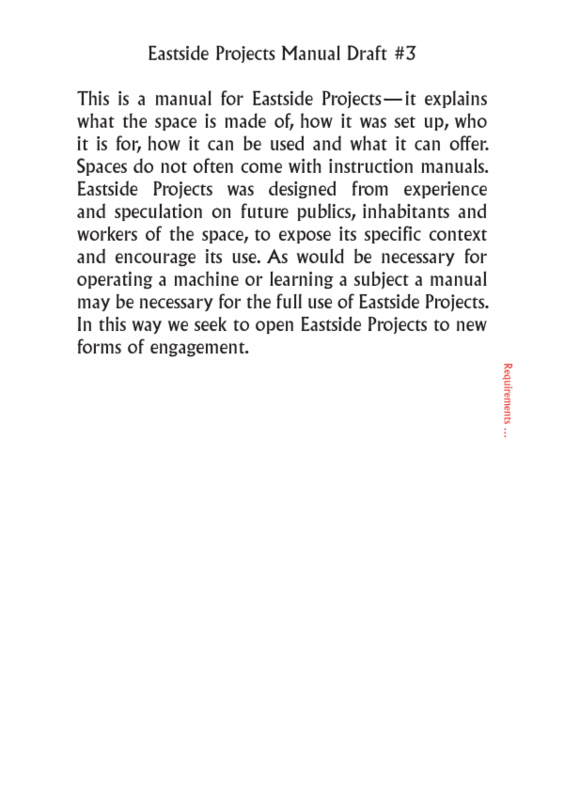 As would be the case for operating a machine or learning a subject, a manual may be necessary for the full use of Eastside Projects. 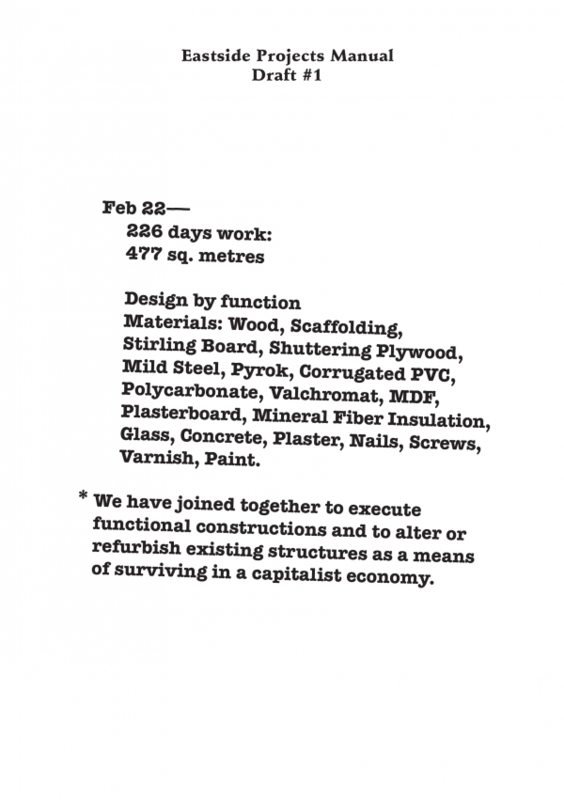 We join together to execute functional constructions and to alter or upcycle existing structures as a means of surviving in a capitalist economy. Drafts #1-6 In the previous six drafts, the manual has been structured as functional chapters (Draft 1-3, 2008-2010), an alphabetical compendium of verbs (Draft 4-5, 2011-2012), and as a children’s story (Draft 6, 2013). 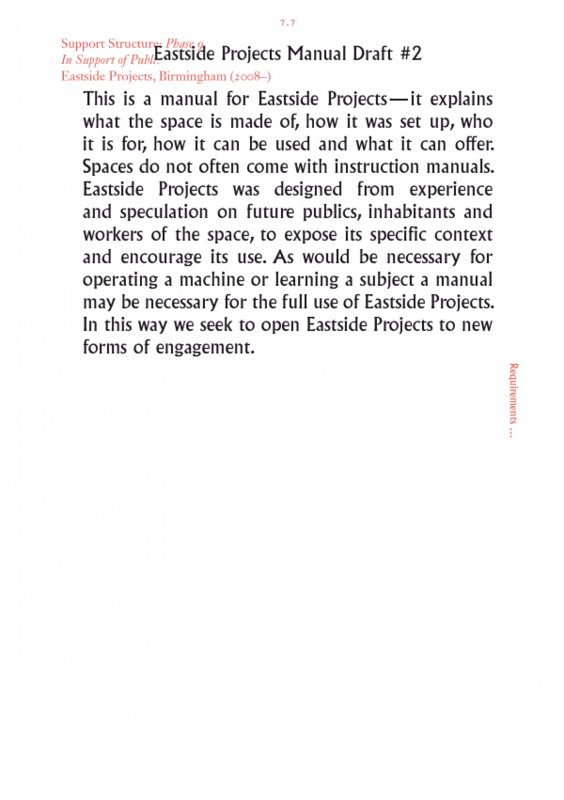 Each of these interconnected drafts describes an activity engaged in by Eastside Projects as an organisation or a process occurring in our multiverse. Draft #7 For the new Draft #7 we are creating a multipart publication planned to exist in print form and online animations. 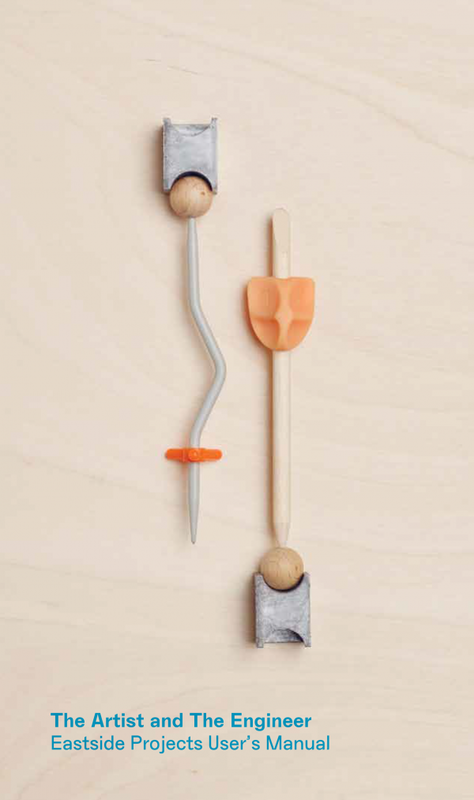 Two print parts and one animation have been published to date, with more to follow. We are artists at work and Eastside Projects is a living demonstration of what happens when you use your imagination in society. As the differences and multiple positions of lifestyles, beliefs and life opportunities have come into harsh focus in the UK and across the world once again, art’s innate ability to operate as a comprehensive – rather than specialist – tool is more urgent than ever. We have explored the roles of the artist and our ability to make art anywhere, anytime, anyhow, with and for anyone, over the last eight years. We are a public good that affects how people think and talk about Birmingham, how people produce culture, how they act and perform, how the city makes cultural strategies and imagines its public artworks. Our future programme builds on our work around art as trade, art as display, art as production process, art as policy making, art as place making and art as housing towards our mission of Making Art Public. Our approaches are to work at different time scales (quick and long term), policy scales (individual to governmental) and engagement scales (cumulative, responsive, provocative).